For parents, sending a son or daughter off to college is always a little bit frightening. After all, they’re leaving home, moving in with new roommates and embarking on a whole new stage of life. And for parents who didn’t go to college themselves, the process can be even scarier — while you want your child to succeed, you may feel like you don’t know where to start or how to help. If you’re a parent in this position, don’t worry! Many parents of first-generation college students feel exactly the same way, and schools and other institutions have developed plenty of resources to make sure you, your student and their college are all on the same page. Studies of first-generation students make it very clear: kids who are the first in their family to go to college face unique challenges and need support, and, too often, they don’t get enough. Inside Higher Ed spoke with Curtis Washburn, associate provost at Chaminade University of Honolulu, about the unique issues facing first-generation students and their families. The article goes on to look at the impact of those issues. Students whose parents never attended college are less likely to take college prep courses in high school, discuss college with their parents, and apply to college at all, according to the National Center for Education Statistics. First-generation students consistently take fewer classes, complete fewer classes, and earn lower grades than their classmates whose parents attended college, according to the NCES. As a result, they’re less likely to graduate. Because that support is so important, there’s no shortage of advice out there for parents who want to help. ACT (the same organization that conducts the standardized test) offers some specific advice for parents of high school students: get involved in your school’s parent-teacher organization; help find after-school or summer enrichment programs; and talk with counselors, teachers and the principal to make sure they know your student’s goals — and to ensure they’re taking classes that will help achieve them. Even if you don’t have time for all of these options, you can still help in smaller but equally important ways: provide a quiet study area, offer encouragement and give your son or daughter the time they need to work on schoolwork. 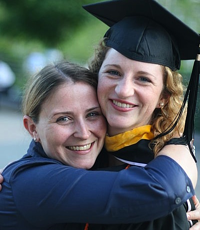 Once they’re ready to head off to college, there are other ways to continue to help. This article from Education.com offers more advice for guiding your first-year college student’s transition from “high school ways” to “college ways.” And college campuses also offer both online and offline resources. The second half of this article outlines the offerings at a few schools; this website from the University of San Francisco is a good example of first-generation advice directly from a college. Some colleges offer “bridge programs” that can also assist both students and parents with the college transition. As Fastweb defines them, “Bridge programs help first-generation students become more comfortable on campus and can make up for a lack of college preparation during high school. These programs usually take place the summer before freshman year and can make the transition to college smoother.” A bridge program will help your daughter or son get used to life on campus without the pressure of classes, so make sure and check with the schools on their wish list to see if these programs are offered. Finally, whether your child is in high school or college, a local mentor can also provide crucial assistance. By finding a trusted adult with college experience, you and your student will have someone to turn to with those specific questions about applications, financial aid and other details. Preparing your student for college is important — and navigating the payment and financial aid process is just as crucial. In the case of first-generation students, this is where an experienced mentor can be most valuable. Students and parents can also get expert advice through events like College Goal Sunday, in which financial and education professionals sit down one-on-one and walk you through the financial aid process. Online, ACT provides a good overview and resources, and CollegeUp.org and FirstGenerationStudent.com both offer firsthand financial advice from fellow students, graduates, parents and education experts. And here on Success By Degrees, we recently published an overview of the five things parents need to know about financial aid. It’s not specific to first-generation students and their families, but it will provide you with one more guide as you strive to help your son or daughter become the first in your family to finish college.